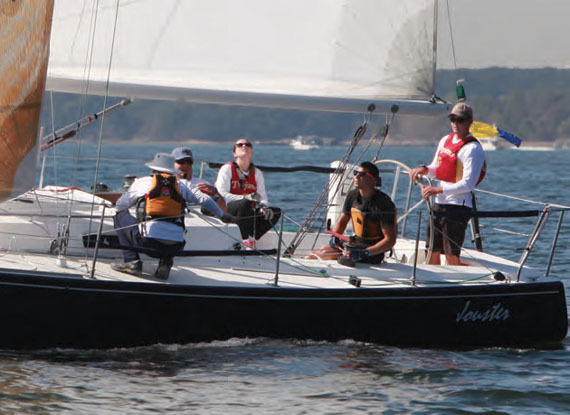 The Storm Trysail Foundation and the Larchmont Yacht Club teamed up to run the world’s largest college regatta on October 8 & 9, with 400 collegiate sailors competing in the 2011 Intercollegiate Offshore Regatta on a fleet of 47 boats ranging from 35 to 44 feet. School teams came from across the country to race in the placid waters of Long Island Sound off Larchmont, NY. Three light air races were sailed on Saturday and the race committee started two races on Sunday, but had to abandon each after the wind shifted too much. After the second abandonment the wind died away to nothing and never returned. 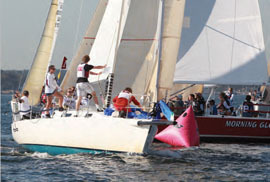 The overall winner was Maine Maritime, which won the eight-boat J/109 fleet with a perfect score of three firsts aboard Jack Forehand’s Strategery. They were leading the fourth race when it was abandoned. 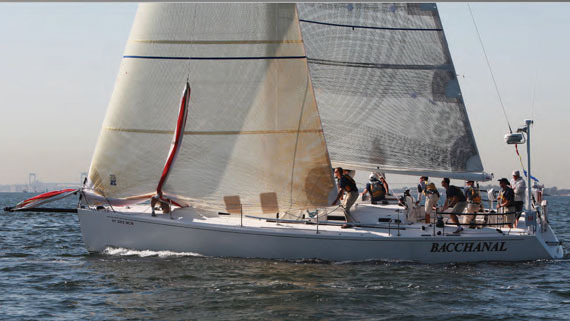 The other division winners were the US Naval Academy, which won two divisions: the 12-boat IRC 40 class on Jan Smeets’ J/133 Bacchanal and the seven-boat J/44 class on Bill Ketcham’s Maxine. Tufts University won the five-boat IRC 35 class for the second year in a row on Dave Kellogg’s Corby 33 Eclipse. First time participant USC won the 15-boat J/105 class on Julian Croxall’s Jouster, prevailing in a tie-breaker with last year’s overall winner, the US Merchant Marine Academy at Kings Point, NY. USC traveled all the way across the country to attend the regatta with their coach Mike Segarblum. The US Naval Academy won the IRC 40 Class. Thanks to the financial support of the Storm Trysail Foundation and sponsorship from Rolex, vineyard vines, Caithness Energy, Safe Flight Instruments, UK-Halsey Sailmakers, Coke, Heineken and Gill, the regatta was totally free to the participants and the boat owners. Larchmont YC provided free moorings for over 30 visiting boats. For more information, photos and a link to the results at yachtscoring.com, visit stormtrysailfoundation.org/intercollegiate.htm. Barby MacGowan of Media Pro International contributed this report.